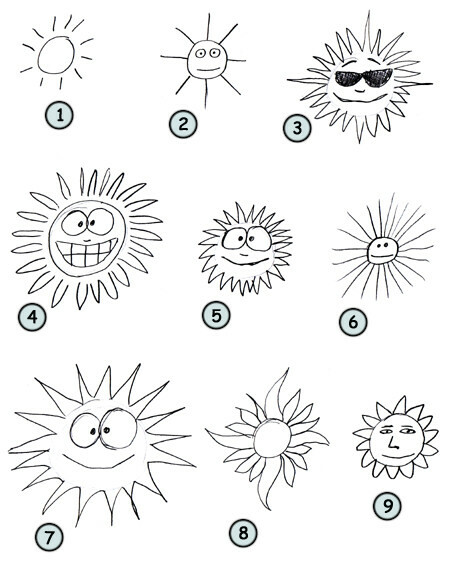 Drawing a cartoon sun: some fun facts before starting sketching! Sunlight takes around 9 minutes to reach the earth. In the north pole, the sun cannot be seen for at least 180 days. The earth is 300 000 times smaller than the sun. In this tutorial, you will learn to draw a sun. This majestic star is burning since the age of time. And it will continue burning for a long time! The core of the sun, when seen from the earth, is a white and very intense light (3). Around this light, an orange shadow (2) can be observed. 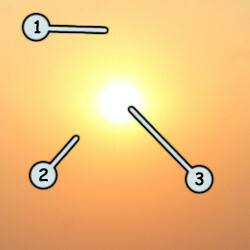 When making a graphical representation of the sun, the solar rays (1) are very often drawn using simple lines. The shape of the sun is a simple circle. Drawing the solar rays can be done two ways. By adding a group of lines or simply by drawing an orange/yellow shadow around the body of the sun. This star is very massive and hot, but since it is very far from us, it appears very small in the earth's sky. Let's draw a simple sun with a smiley face. First, draw the body of the sun by sketching a circle. Then, add two ovals to form the eyes. Next, add the pupils and the mouth of the sun. Finish your work by drawing the solar rays. Draw the four rays on top, on the left, on the right and at the bottom of your sun.Then, add more rays between the first four rays to keep proportions accurate. Finally, add color to make the drawing more enjoyable to the eyes. There you have it! A funny, amusing sun. You can always draw a simpler sun by drawing only a circle with a couple of lines (6) (2). Or you can make a more cartoonesque one with some eyes or sunglasses (3). Just use your imagination to create the most original sun of them all.